MAGNETIC ENGINEERING - This playset contains 8 blue and red glitter magnetic rods and 8 non-magnetic steel balls that let you connect and build whatever awesome creations you want. Make an architecturally sound bridge (glitter, of course! ), a shining star, or something wild and undefinable. The choice is up to you! DISPLAY PANELS - With our new assorted panels, you can take your creations from scaffolding to a colorful reality! 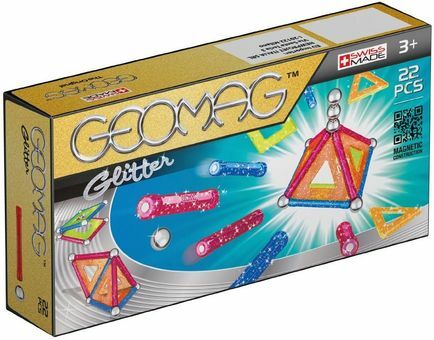 Including 6 glitter geometric pieces of assorted sizes, colors, and shapes, magnetic construction just got way more in-depth! SPECIFICATIONS - Package includes (8) blue and red glitter magnetic rods, (8) non-magnetic steel balls, (4) yellow glitter triangle panels, and (2) green glitter square panels. Warning: CONTAINS SMALL PARTS. Not suitable for children under the age of 3. Recommended for children ages 5 and up. Warning: CONTAINS STRONG MAGNETS. Keep away from sensitive devices such as credit cards, computers, magnetic media and medical devices like pacemakers.